Valve prepping Steam for Mac launch? Steam, the achingly popular games distribution service for PC, is set to get a Mac makeover, courtesy of its makers Valve. Although Mac addicts aren't exactly known for their gaming habits, it seems that Valve is happy to take a plunge into the world of Apple, hinting at what is to come in a series of cryptic adverts. The best of which include Half-Life's Gordon Freeman wearing Mac colours and a parody of the original Macintosh print ad which is filled with send-ups. Steam's popularity on PCs is nothing to be sniffed at, with 25 million users, 1,000 odd games and 12 billion player minutes a month clocked up. 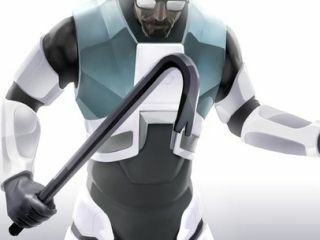 The fact that teaser images have been sent to a number of sites – the Gordon Freeman one was sent to MacRumours – with the tag, "in anticipation of an upcoming announcement from Valve" does mean that something Mac-based is more than likely. The likes of TeamFortress 2, the Half-Life saga and Portal have already made their way to consoles, courtesy of the Orange Box, so it only seems fair that Apple users get a sniff of Valve's content as well. And with all new Apple's coming with an Intel chipset and Nvidia GPU, they should be well equipped to handle gaming, as long as Valve have got round the fact that DirectX isn't part of Apple's OS.